Thorough cleansing of dental equipment is a painstaking job. A tissue with alcohol-spray will generally spread nasty viruses but will neither kill nor remove them. Disinfecting agents like alcohol only work properly if everything is first cleaned at a good household level. This will take five minutes for an average dental installation. Alcohol should then be applied and the installation should remain in alcohol for at least five, but preferably for ten minutes. Due to a lack of time in daily practice this is virtually never done. The majority of dentists cannot afford to be without their equipment that long (visit links). Suction hoses don't just hang in your mouth. They terminate in couplings that can accept several kinds of suction-pipes that can be sterilized or disposed of. 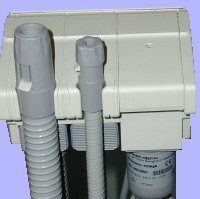 These couplings are equipped with a turning ring ( to prevent the hose from curling like the system in your vacuum cleaner ) and a small mechanical slide to switch the device on and off. Couplings can not be detached from their houses and will be heavily contaminated during the patient's treatment. 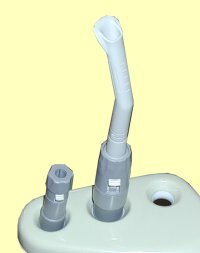 The biggest suction pipe connected with the widest hose is operated by the dental nurse. She places the pipe as close as she dares to the high-speed drill. These pipes should evacuate all particles, blood, saliva and cooling water that the high-speed drill spits out with considerable force. The small evacuation tip is generally flexible and continuously slurping in the corner of your mouth in an effort to prevent you from drowning. Suction devices are the most disgusting devices in the entire dental surgery. For those with strong stomachs we are going to take a closer look. 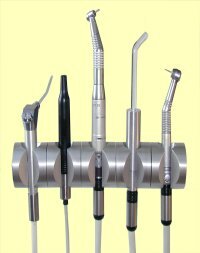 Like all dental instruments suctiondevices are constantly placed in and removed from the instrumentpanel and their holdingclamps. Instrumentpanels can not be detached to be soaked and scrubbed in a good hot bath. We think that in real surgical theatres these devices would be banned immediately. Like surgeons, dentists constantly deal with blood,saliva and exposed tissues. Another prize winner in the race for dirty dental devices is the spittoon. It's used to get rid of all the waste materials that fill your mouth during treatment. That waste is highly contaminated and not everything you spit out with your anesthetized lips really reaches the bowl. Waste materials should be evacuated constantly and immediately. There should no longer be place for such a mediaeval device in the dental theatre.